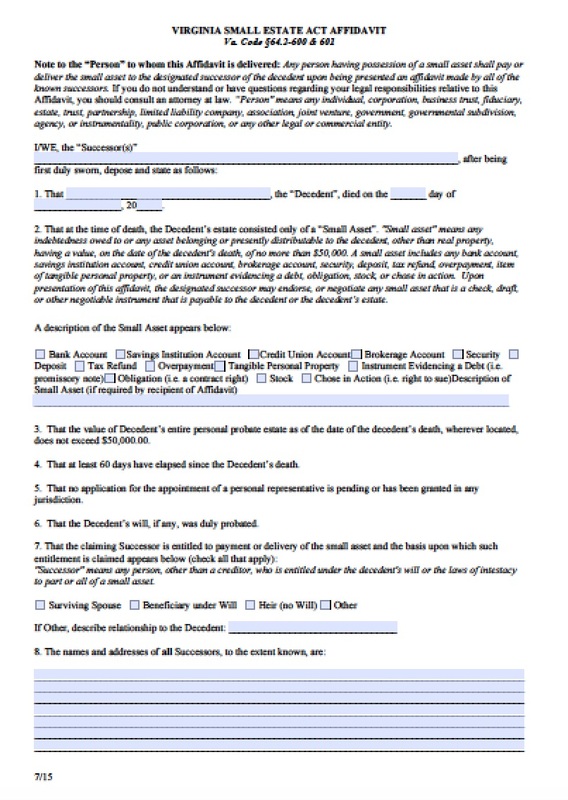 If a loved one in Virginia dies without a will, there is no application to become the administrator of the estate, and the personal property values $50,000 or less, then successors may file the affidavit of heirship to collect bank accounts, final paychecks and other debts, vehicles, heirlooms, and other personal, financial, and tangible property owned by the decedent and distribute it among the heirs, or sell the property. Creditors may also file this affidavit as long as they have evidence of the debts owed by the decedent. There is a waiting period of 60 days before any interested party may file the affidavit of heirship in Virginia, per Va. Code Ann. § 64.2-601.